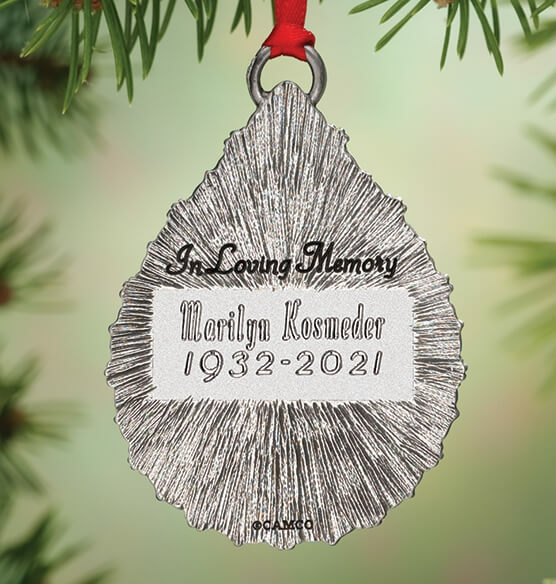 Personalized memorial ornament honors the memory of a departed loved one. 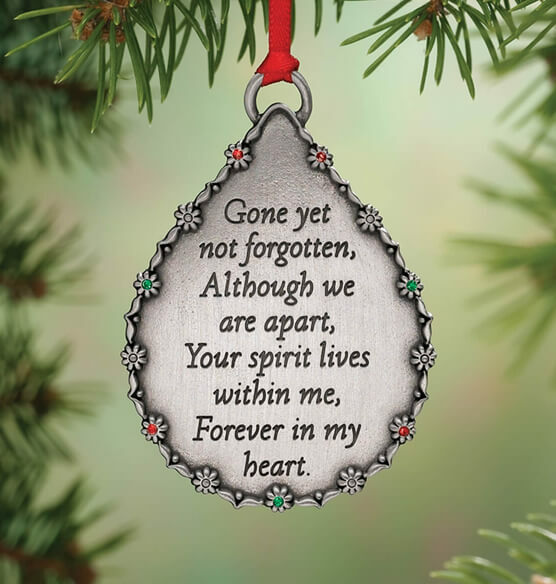 This personalized memorial Christmas ornament’s poem confirms they’re "gone, yet not forgotten". The pewter tone teardrop features sparkling red and green crystals. Back in engraved with "In Loving Memory." Metal. 2" long x 2 3/4" wide. Specify name or message; limit 2 lines, 20 letters/spaces each. We’ll personalize with name, dates or special sentiments. this item is well made,& i like that i had the inscription on the back.thanks for a nice product. I purchased three for myself and sons as keychains after we lost my oldest son in a motorcycle accident.Having my sons information engraved on the back makes it so personal.It causes us to think of him everyday.. I ordered one for my tree on behalf of my late husband. After seeing how beautiful there were I ordered 5 more for my children and grandchildren. Just beautiful. Inscription in a teardrop says it all. Perfect memorial ornament for all family members. Purchased one for myself and two for family members for Christmas. Will keep it out all year long. Perfect ornament to remember someone special on your tree. It brings back great memories of the one who has left us. This was a memorial gift for a few friends. I chose this as a rememberance of my Dad who passed away this year. So he will be remembered and still be part of our celebrations. It will look nice on our tree or hanging from his picture. Family members were touched by seeing these ornamental reminders on the tree. I love this, Just what I was looking for,! First year of husband's death, and wanted a special ornament to remember him. Beautiful and engraved. A good quality product ! Is going to make a great Christmas Gift! This is a very high quality ornament. Will display on Christmas tree for years to come. This memorial ornament is one of the finest pieces I have ever owned. It is exquisite and I will place it in my home all year round. It is a beautiful piece that I will treasure always. This was a little token remembrance to a friend who lost her husband. She kept it by her bed. I gave these as a gift to my niece and nephew as their loved ones (father & grandfather)had passed away within one week of each other. I was unable to attend the funeral home/funeral, so I felt this was a good way to show my love and condolences, and show them that even though I was not with them personally, I was with them in every other way that matters. They loved it! Will use it for Christmas. My mother was buried on Christmas Day. This is a worthwhile ornament for my Christmas tree. Memories don't leave like people do. This is unique and exquisite ornament. It is beautiful on the Christmas tree however, you could display it all year if you choose. I especially like that you can personalize the ornament. Truly beautiful and shares a heartfelt sentiment. Very nice, I am happy with this. This is beautiful. The Tree of Life I had previously ordered was no longer available. I ordered this and it's just as nice. What a nice remembrance this will be. Well worth the money. This ornament is beautiful and the engraving on it is impeccable. I have a wall that has family pictures, including my late furbabies. I had ordered one for both of them, then I wanted one to hang next to my late husband and my picture, so I ordered one for him. It is now hanging on the wall as well, and when I put the Christmas tree up, all three ornaments will be on the tree. I am really proud of how they came out. I will be giving them as Christmas gifts to my kids and my brother and sister. They are a beautiful way to memorialize 2 people I love very much. I ordered 3 different memorial ornaments for a section of our tree dedicated to my sister who became an angel on September 26. One was from her Nephew and his son, one from me and my husband, and one from her husband. We hung them below a Christmas picture of her. Every year when we decorate our tree these will remind us of her beautiful soul. I would recommend these for anyone who has lost a loved one. The quality exceeded my expectations for the price. This ornament was for my sister and her husband in memory of their son who passed away. They loved it and it was a beautiful addition to their tree and a way to honor their son. I would buy this ornament again. My son died 4 months ago and I bought this in remembrance of him. Absolutely beautiful!!!! I will buy other things from here in his remembrance. I have bought many engraved pieces form here and always high quality. Every year I purchase a personalized Christmas ornament for all of my children. This 15 silver bell. They are beautiful. Thank you, Miles Kimball, for your expertise. Tribute keepsake in memory of my Mother that I lost this year. Excellent quality. The ornament was exactly as described and the engraving was correct. A good value for the money. This is a beautiful sentimental ornament. Even the grandsons wanted one for their grandpa. This ornament is very durable and the personalization is done beautifully. I wasn't sure what to expect when I ordered this item for my Mother in Law after the death of her husband of 44 years. Not only was I pleased and happy with the choice, my husband, was equally pleased and happy to have us give this to his Mum on Christmas. We know she will be touched and will hang it in her house as a remembrance of the love they shared and how much he still means to her. Thanks for such a wonderfully made item. This item was awesome. Will order more. On a chain as a pendant.A very nice way to remember a loved one. I bought this Memory Ornament for one of my best friends in memory of her sister. She loved it. This was purchased for my mother that past away in February. Our first Christmas without her. She loved Christmas. Very nice way to remember a loved one at Christmas time. oRNAMENT AS SHOWN IN CATALOG. THE ENGRAVED NAME WAS A LITTLE RUSTIC, BUT ACCEPTABLE. Not exactly what it seems. Beautiful ornament. Great reminder of my parents. Engraving should have been darker, more prominent. Great price. Got a set for myself and my daughter. I found the personal engraving very hard to read. I love the concept of this ornament as well as the tear shape; however, I was disappointed in the engraving. The engraving looks very cheap. I expected it to be the same style and look like the engraving on the front. I think my friend will appreciate it and like it anyway. The front of the ornament is nicely done but the engraved personalization is so light that it is barely readable. I like the universal sentiment on this memorial ornament a lot, but the personalization is awful. I can hardly make out the engraving at all it is so faint. Definitely not worth the price for such low-quality engraving. Would definitely not order any item from this website personalized on metal. Whatever the engraving technique being used, it's definitely not working. I got this ornament in honor of my mother's passing on her 90th birthday in 2016. I love the design and the sentiment, so imagine my disappointment when the personalization is barely visible, even when you turn the ornament so that the light reflects directly off it! If you don't care about the personalization or want to do your own, fine. But the job that M. Kimball did I found to be very disappointing. I got this is honor of my mother. The ornament design, finish, and sentiment are lovely, however, even when turned to the light (let alone on a tree) the engraving is almost impossible to read. I am very disappointed. The engraving of the deceased's name is so light. You can barely see that there is anything there. The engraving of "In Loving Memory" is so clear and can be seen from a distance. It makes no sense for the name to not be engraved in the same fashion. I was very disappointed in the memorial ornament. I had ordered two last year for friends who lost their fathers and they were very nice. This year I ordered one for my dad and you can't even see his name engraved on it. Very disappointing for the price. I would not recommend this particular item to anyone. I have this same one for my mother and I just recently ordered one for my father. This one is for my father in law. The words perfectly capture my heart on the passing of my mom. I ordered enough for all of the family at her service. I ordered one when my mother passed. I really love honoring her this way. My father just passed and I wanted to do the same for him. We just lost a Dear Nephew and I know his Family will Be Happy to have this. We'll cry very much in our lives Missing our Loved one. This tear just seemed right and glad it could be Personalized . Keepsake of family member during the holidays.